It’s been a staple of the drug war since Richard Nixon gave birth to that monster in 1971. Reporters are summoned to local police stations for big-deal news conferences about small-fry drug dealers. Federal, state and local cops–not the ones who did the work, but the ones who wear the titles and take the credit–line up on one side, laser-printed images of their latest loot spread out on storyboards on the other. The cops speak their lines. Reporters ask the same questions that have been asked for 45 years. Everyone pretends that there’s something newsworthy under the sun though the whole charade wouldn’t fill a four-paragraph news release. And by sundown the synthetic event has turned lead story in every local market. Rarely do the media so gladly abandon all standards of truth and objectivity than they do when covering drug busts, buying into the exaggerations, the half-truths, the outright lies. We went through this with heroin, pot, crack, meth and prescription pills in an evolution of hype over the decades, with each drug at one time or another declared public enemy Number One (the original phrase belongs to Nixon of course). Each drug in turn was blamed for demolishing our youth and endangering our future. Funny. We’re still here, except that the potheads who couldn’t have made it through college without inhaling are now lecturing us about fake pot. That’s the new craze. All the other stuff has become outdated. So there we all were at the sheriff’s office last week, where Sheriff Jim Manfre picked up right where Don Fleming left off, a half dozen TV stations’ cameras dutifully rolling, and a dozen of the usual law enforcement suspects arrayed before us, telling us how dangerous synthetic pot is, how important it is for the media to spread the word because the problem has grown to epidemic proportions. I don’t know how many times I heard that word, but it was itself an epidemic. And of course, it’s a lie. There is no such epidemic. 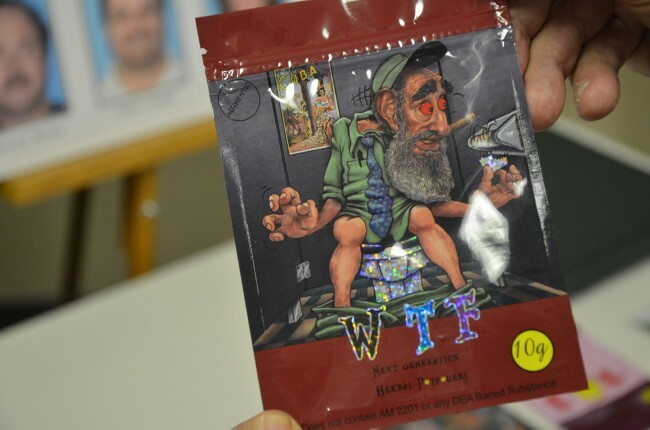 Synthetic pot in some cases can be a very bad thing, depending on how it’s made. But its make-up is constantly changing as its makers try to stay ahead of the law and out of the controlled substance list. Calling it marijuana is without question a misnomer in several regards, not least of which that marijuana is not dangerous: it’s not only safer than tobacco, but in more enlightened, less sadistic states than Florida, it’s finally been recognized for its medicinal values (which you can’t ascribe to tobacco). Synthetic pot co-opts the name of a mostly harmless, often useful product to literally spray its chemical gunk on it and pass itself off as something it isn’t. Again, depending on its make-up, it can trigger hallucinations, severe agitation, tremors, paranoia, and in very rare cases—far fewer overall, keep in mind, than the daily death toll of prescription drugs—death. It happens in isolated outbreaks, the latest one in Colorado this month. But to call any of this an epidemic is simply irresponsible. The media are much to blame in this for amplifying the lie almost maliciously so. The Centers for Disease Control has never called synthetic pot an epidemic. But researching the story on the sheriff’s pot bust last week I came across this line in innumerable news reports: “The rise of synthetic drug use in the United States alone has reached epidemic proportions and has resulted in a sustained rise in emergency room visits, deaths, and violence among teens and young adults.” It was attributed to Harry S. Sommers, special agent in charge of the Atlanta field division of the CDC. The same line ran in reports by ABC News, the Associated Press, the Miami Herald and an endless number of allegedly reputable news sources, including the hundreds of newspapers and television stations that subscribe to the AP. I wanted to call Harry Sommers to check whether he’d really said it. So I fished around for his contact at the CDC. And wouldn’t you know it: there is no special agent in charge of the Atlanta field division of the CDC. Harry Sommers is a special agent all right, but with the Drug Enforcement Agency, whose special agents are naturally high on hype, propagandizing the drug war out of self-preservation. But all those media outlet hadn’t bothered to check their source. They’d cut and pasted. Just like all the top cops at last week’s news conference in Bunnell. “The existing social and legal policy is out of proportion to the individual and social harm engendered by the use of the drug,” the commission had concluded, noting that harm and “lurid atrocities” commonly associated with the drug were patently false—much in the way that “lurid atrocities” associated with innumerable drugs since, fake pot included, have generally been more exaggerated than accurate. It’s pretty simple really. Take any drug of your choice. Tally up its devastations. Its deaths. Its wreckage of families and individuals. It won’t approach the wreckage and lethality of either legal tobacco or alcohol, though by treating drug use as a criminal offense, the costs on society, social and economic, are multiplied, with police reaping the windfalls’ larger share. Those news conferences are their budgets’ freebasing. Nixon, of course, snuffed out the marijuana commission’s findings. He was already high on his drug war by then, among other Nixonian atrocities. Jimmy Carter’s brief flirtations with decriminalizing marijuana early in his one term aside (he proposed decriminalizing possession of up to one ounce in 1977), no president since has dared be less than a demagogue on the issue, Barack Obama included. You can only blame politicians so far. Making stuff up is their survival’s narcotic. You might expect a little better from the press, at least on occasion. Drug-war reporting is not one of those occasions. At least they got the name of their big bust almost right last week at the Sheriff’s Office: “Operation Bad Dreamer.” When synthetic pot loses its charm, maybe we can go after sleeping pills next. It is apparent that the only frauds in this, is the politicians and “brASS” (upper management of law enforcement agencies). And any fool on the street, with at least 2 brain cells remaining, know to stay away from that crap and don’t use it, not even to pass a piss test. So if people with two brain cells know better, how many brain cells do the people delusionally stating “Epidimic” have. Drugs (including alcohol) have been around for 6000 years. Nobody is going to eradicate them. Nobody is going to change the minds of those that want to ingest them. Legalize them, and tax them !!! Oh but Manfre will eradicate all drugs and crime in this town. … How’s our crime rate? Pot is pot and is a drug PERIOD. All they want is to get their grubby hands in on the action to collect revenue from the sales of “fake” pot. This whole thing is plain STUPID.. Would you give it to YOUR kids, sheriff? I really doubt it. The ‘War on Drugs’, if ever effective, would put a lot of folks out of business. Think just for a moment about the many businesses and many jobs that have created in: Law enforcement, the judicial system, advertisement, real estate, luxury items (cars, jewelry, boats, airplanes, clothing), Wall Street, banking, and public school educational systems. There have been thousands of jobs created around the design of this ‘War’. And, undoubtedly, billions of dollars daily that pass from one hand to another. “Stop it” – you have to be kidding! Drain-o and a host of other items will kill you too but you don’t see anybody going after those manufacturers and retail outlets. Let Darwin’s theory run it’s course. We are spending BILLIONS trying to protect dysfunctional from themselves. This has go to stop. It is unfair to the tax payers to build prisons the size of Disney World with the latest and most expensive cutting edge weaponry and surveillance systems known to man,free health care,free dental etc,etc,etc… People on social security don’t have it as good as people in prison. The murderers,rapists,child molesters,yes. Your pot smoking knuckleheads no. Let the herd thin itself out naturally. I would argue, and agree with the notion that alcohol and tobacco have ruined more lives than pot. I would argue that since they are legal and widely sold that they have ruined many lives simply because they are much more prevalent. We can’t say for sure that given the same availability pot won’t be just was ruinous. Regardless, I am tired of having my money spent on arresting, defending, and housing convicted drug users, which diverts money away from things I would rather spend it on. I say, force people to go through three rehabs at public expense, and if they keep using after that, out them on an island and give them all they want. It would certainly be cheaper than providing legal representation, housing, and food in prison. I spend enough money on pricey gymnastics, horses, and raising animals for 4-H to beneficially occupy my kids’ minds that I don’t think I should be forced to pay for your pothead in prison. To say this is an epidemic is the wrong word. Pandemic would be more appropriate as this is affecting our nation, not sure about the world. In the close to 15 years I have worked in and around illicit drug users, the past two or three years has brought significant change. Bath Salts and this “fake” marijuana has an effect that Heroin or cocaine has not had. I have never seen someone die from smoking a joint or a bowl of crack… Just one bowl. I have seen two people in our region go right into cardiac arrest with Remix (one version of this “fake” marijuana) twice in the past year. I have also seen another brand cause seizures on a couple different occasions, recently. A couple years ago, I saw an adolescent teen attempt to huff, straight from the copper pipe, freon out of an air conditioning unit outside of a private residence. He sustained significant chemical burns to his lips, nose, mouth, and inside of his mouth. What in the hell are these people thinking? Furthermore, the chemicals that are being used to make the “shake and bake” single bottle crystal meth is ridiculous in the sense the drugs these are trying to mimic would be much safer if they would have just taken cocaine or crack. You do not see the HazMat teams at a crack house decontaminating the crack addicts or dealers! The amount of money that is spent treating medically these idiots, attempting to eradicate, prosecute, or enforce this could be waived and used for recreation facilities in our communities. The actual drugs that they are trying to mimic are much safer than the manufactured drugs. Legalize them all. It would make everyone safer. I have to agree that this new age of trying to get high and pass a UA while doing so is causing more harm than good. I also know of a person who had a really bad reaction to fake pot and nearly died. Has it stopped that person from ingesting it? NO. Why? because this person has to pass UA’s on a regular basis. Yeah, i’d rather see that person smoke pot…….it is safer. Legalize it, tax it, and get it out of the “drug war” that is costing us so much. There are plenty of “real” drugs out there to go after. Seems to me that allowing citizens to grow their own , and/or buy it legally would cost us as a country much less than what it costs to fight a war we are not winning, prosecuting, and housing in prisons the potheads. Im just curious, does anyone know of any single person that has ever smoked some pot then got violent? I WISH he would have smoked pot instead. I may have had a fun childhood rather than being beaten every time the alcohol or cocaine was gone (mostly alcohol, due to availability). If it were that way, I may have a real relationship with him today……….alas, it isn’t so. Now he gets his drugs legally through the VA…….3 months worth of oxycodone at a time delivered to his doorstep, which he proceeds to ingest at a rate of about 3 times the dosage and chews them so they will be dissolved faster . Some might think that it’s ok because it is prescribed, but what do you think happens when that 3 months worth runs out in less than a month? He is on the street looking for it illegally, or anything that will give him the same type of escape. What’s also not ok is that upon trying to discuss this with my father’s VA doctor, during a series of strokes he recently had, I was told that they had no intention of trying to curb his addiction because, and I quote, “Your Dad has real pain”. Gee….I still wonder what caused those strokes to begin with…. People who smoke pot aren’t looking to check out of society, they are just looking to lighten the mood, relax, laugh a little, and still be in control of themselves. Alcohol causes one to lose control, and makes monsters out of many people. We are all paying that price as a society, not just the kids. Do I smoke pot? No. People who smoke pot come from all walks of life, believe it! How about taking the money that is spent on fighting weed (a natural substance, not chemically transformed for street use) and spend it on going after the way the drug companies push their chemicals to fix every thing under the sun? Encourage a more holistic approach to medicine. How about taking that money and using it to pursue a situation where only a doctor can administer addictive prescriptions in the setting of an office or clinic, that could effectively reduce the number of prescription drug addicts. How about spending some of that on giving parents the knowledge to raise a generation of kids with self esteem and moral character. That could be useful…….in all areas of the drug war. What about making it easier to get counseling services and removing that stigma to help people through bad situations in their lives so they don’t have a desire to turn to drugs? Jobs wouldn’t be lost overall, they would just be in different fields. And our society would improve at the same time. Here’s an idea….give some to Congress…….maybe there would be less fighting and more getting done. Focus the “War on Drugs” on the real drugs and issues that are killing our future! Pot isn’t it…….just a revenue game.